These CornClusters are every bit the real thing. Made by Evolution Carp these clusters will take on any of your favourite flavours. 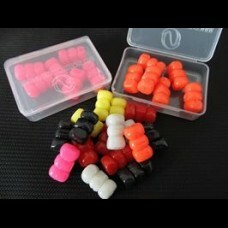 Semi buoyant and idea as popup or critically balanced presentations or pin down for bottom baits. Fish safe as they are so soft if the Carp ingests them they will safely pass through and out the other end. By using these immitations you get rid of any doubt that your rig may have been busted giving you the confidence to leave it out for as long as it takes. Simple to use via hair rigging.